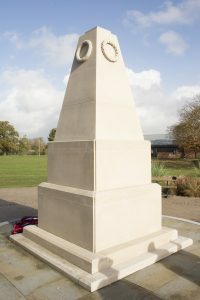 A Gathering of Remembrance takes place at the War Memorial at 11am on 11th November each year. 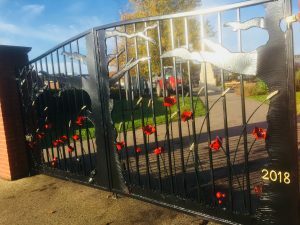 The gathering is open to all and the Council, local schools, community groups and other organisations lay wreaths and observe the two minute silence at 11am. 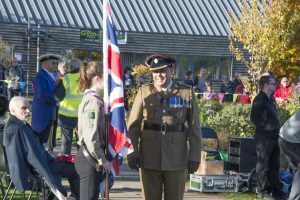 Over two thousand local residents gathered at Woodley Memorial Recreation Ground on Sunday 11 November 2018, to commemorate 100 years since the end of WWI and to remember those who have fallen. 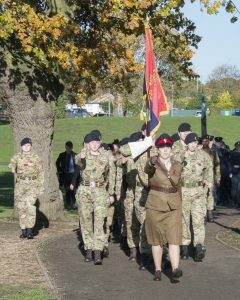 Woodley Town Council and St John the Evangelist Church led a commemoration service and were joined by Woodley Army and Air Cadets and the 5th Woodley Scouts, who all marched to the Memorial across Woodford Park. 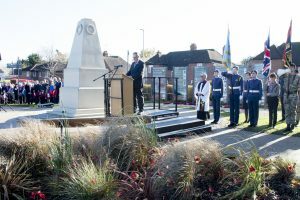 The Exhortation to the Fallen was read by a member of the Army Cadets, while the Kohima Epitaph was read by Town Councillor Brian Franklin. 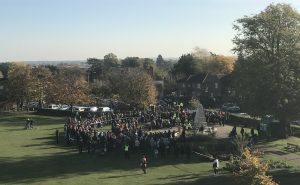 The Rolls of Honour of both World Wars were read by St John’s parishioner David Crane, followed by a prayer led by Rev Eddie Márquez-Picón, of St John’s. 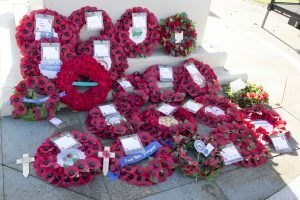 The laying of wreaths was led by Woodley Town Mayor, Councillor Sam Rahmouni. 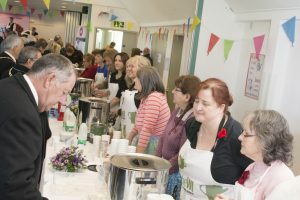 Following the commemoration, tea, coffee and cake was served in the Oakwood Centre by Woodley Central WI, with cakes donated by the team, Addington School and Richard Lloyd Funeral Services. 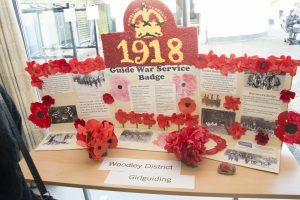 Music, poetry and footage from WWI, as well as a display of WWI images provided by Museum of Berkshire Aviation was also available at the Centre, alongside work from local schools and local Girl Guides. 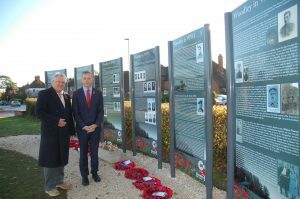 Woodley Flower Club donated beautiful flower displays, while Woodley Carnival Committee provided additional support. 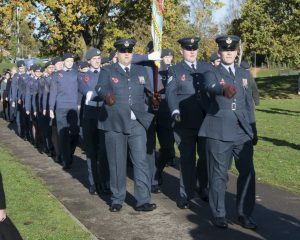 The Council has been delighted to receive very positive feedback about the day and would like to extend its thanks to all those who attended and contributed. 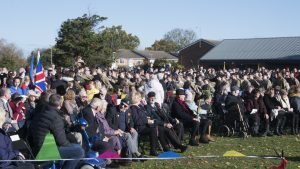 Download free photos of the Centenary supplied by official photographer Nick Martin. 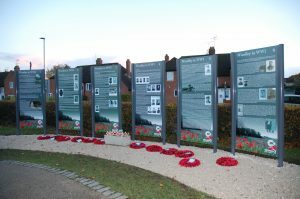 Panels detailing local soldiers who fought in WWI have also been added to Woodley Memorial Recreation Ground. 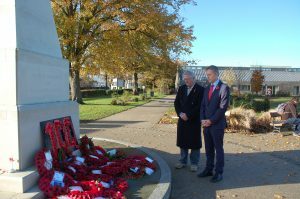 Reading East MP Matt Rodda visited the Panels and War Memorial to pay his respects. Please feel free to download the PDF of the panels to read in more detail. 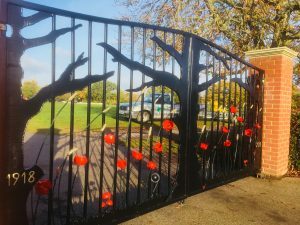 The Memorial gates have been updated to reflect the Centenary with a few additional extras.